[Win10] How do I disable ALL popups? I'm getting "F.lux is disabled for Application" when I open/switch to applications that I've disabled it for. I don't want to see that popup, or any popup ever, to be frank. No option in the right click -> f.lux options to disable it. 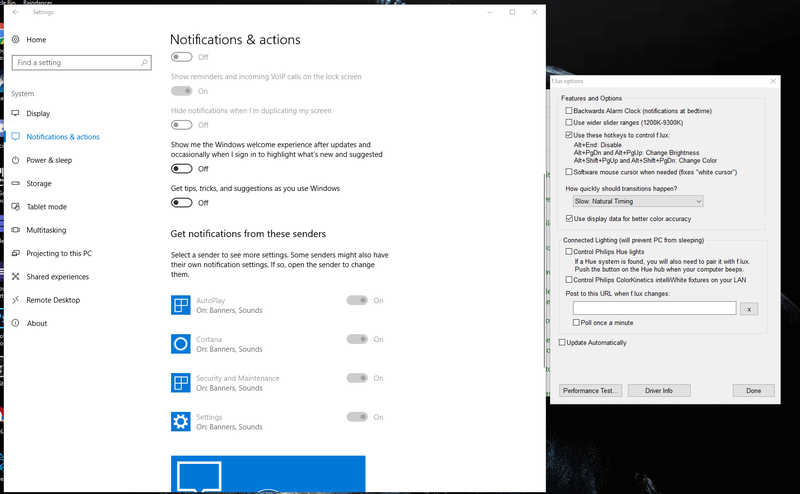 No listing in Win 10's "Get notifications from these senders" list. Where do I disable it? I really like f.lux but I find any popups to be mildly infuriating. There is currently no option in f.lux to disable this built-in notification, but I agree that it's needed. The reason why you're not finding a way to get rid of it in the Windows Control Panel is, it's a part of f.lux. It is something built into it. It's not a Windows Notification that's being sent to Windows via the Notification Area. It's something that f.lux is doing independently. Thanks. I will look for an alternative program instead. Hi @Jamez0r - we display this notification once per session, because it has been the #1 problem people have had... they forget they disable f.lux for an app, and cannot figure out why. We will probably add a way in the future to turn this off, but if you use f.lux for more than an hour, it shouldn't be very intrusive. Hey, just wanted to reply here because i have the same thing. I use f.lux for as long as my computer is on and i use it my computer for the whole day very often, so these daily multiple notifications are extremely annoying. As such i had to revert to an old version of f.lux, since it does literally the same thing without this specific annoyance. The first item in the Options dialog allows you to turn off the "waking up" notifications. This feature is intended also to get you to set your wake time in the software. The other notifications happen when f.lux updates (these are infrequent and will probably stay on), and for the first time f.lux disables for an application (disable by app), only once per session. We will probably add a way to turn notifications off for "disable by app" for people who really know how the feature works. But the number of people who have written to us to say "f.lux never works when I'm using Chrome" made us put this in. We've tried to make it obvious when f.lux is in a different state. Unfortunately I will need to install the old version until this is fixed. I can't stand notifications of any kind, so having no ability to remove or disable them means I can't use this version of the software. Hopefully you guys add a complete disable all notifications option because it is an easy solution to a common complaint. I will be installing the older version on various pcs at work because of the notification. @herf Because of the un-disable-able popups, I too have uninstalled the newer version and reinstalled a version from 2013. If you want to be zen, be zen. I do not want interruptions when I'm working, and if you make it so you cannot disable popup notifications (that steal keyboard focus!) people will not want to use your product. This includes update notifications; let me disable the notifications, or disable the updates. You might think i want to know certain things, but i really just want to be left alone. Your product works well when it is invisible. I like flux, but for the love of Pete, please consider that maybe less is more. Having the same annoyance. Is there anything planned to add this option or do I also have to revert to an old version? I'm just replying to add my voice to this request, since the forum has no "me too" option. please DO add this as soon as possible! More options are better than fewer options. For some reason, we are in an age of settings minimalism, in which options are removed, rather than simply being placed in an "advanced" section (or simplified in some other way). Users want customisation, and an option to toggle notifications on or off is, I believe, extremely important. I concur with @Chucky on being zen. Thank you for a wonderful product! I post here only because I wish to continue using your software, instead of the other options.